"I am brave, and you can be brave also." Hannah Higgins had been having abdominal pain for quite some time. Though she had been seen by a pediatrician, her dad, Josh, brought her to the emergency department where he works for imaging scans. The scans showed large tumors, and Josh immediately thought it was cancer. Hannah was transported by ambulance to Rady Children’s Hospital-San Diego, where she received a diagnosis her father had feared. Hannah had bilateral Wilms tumor (also called stage 5 Wilms tumor), a type of kidney cancer that occurs in both kidneys. She would need surgery, chemotherapy and radiation. 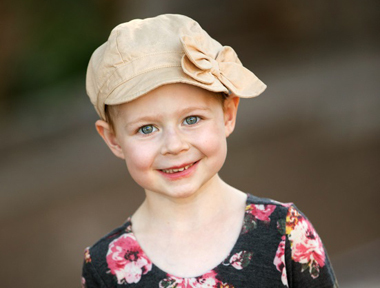 Hannah had her first surgery to put a port in and started chemotherapy right away, which lasted for six months. She then had radiation to her lungs and flank, followed by surgery to remove her left kidney and part of her right one. Hannah’s most recent imaging scans, performed nine months following her treatment, show no signs of the cancer. But she will need scans for a few more years to determine if she’s cancer-free. During her treatment, Hannah seemed to understand her situation and knew what was needed to fix it, even though she was only 5. And she took a matter-of-fact approach throughout her ordeal. During her radiation treatments, for example, Hannah began singing her heart out, all while staying perfectly still. The anesthesiologists were shocked, as children her age usually require sedation. One day, Hannah told her parents that she wanted to do a commercial to explain to other kids what they can expect when going through cancer and show them how brave she has been. She shares her story and a powerful message in a video, which was posted on YouTube. "If you have cancer, don't worry," the 6-year-old says. “Cause I am brave, and you can be brave also."